Presented to the market in true walk -in condition this semi detached villa offers ideal accommodation to a variety of purchaser including first time purchaser. Situated in a Water front location with Panoramic views over the River Clyde and Hills beyond within the residential Kingston Dock area of Port Glasgow. Enclosed front and rear mature gardens. The accommodation on offer comprises of Welcoming Reception Hallway with oak laminate flooring throughout, Bright and Stylish Lounge with window to the front of the property, feature fireplace oak surround, Electric fire. Modern fitted Dining Kitchen with amply storage in the form of floor and wall mounted units, Gas hob, Electric oven and Extractor Stainless Steel and Glass Chimney, further walk in storage cupboard, Laminate flooring throughout, Access leading onto Utility room with single stainless steel sink unit. Plumbed cloakroom with two piece white suite, Door leading onto Enclosed private rear garden with patio area and garden shed. On the upper level there are Two good sized Double Bedrooms one with built in wardrobes and further storage cupboards and other one with fitted mirrored wardrobes. The family fitted Bathroom comprises of three piece white suite with over the bath wall mounted shower and screen, tiling around bath area. The loft space can be access from top hall. 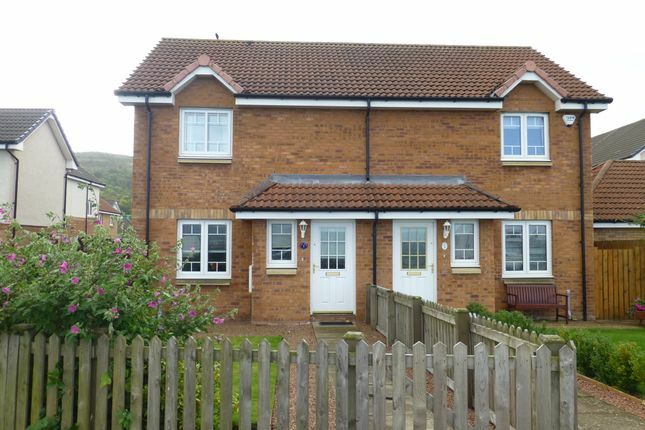 The specification of this property included Gas Central Heating and Double Glazing. The front Garden been laid mainly to Lawn with surrounding flower beds. The private enclosed rear garden laid mainly to lawn with flower pot borders, Patio area and garden shed. Residents allocated Parking Bay to the rear of the property. Viewing is essential to appreciate this outstanding accommodation and locale on offer and the quality of Finish. From our office in John Wood Street turn left onto King Street, turn left onto Bay Street, Carry along onto Fore Street, Turn right and then immediately turn left onto A8 / Greenock Road, at roundabout take 2nd exit, at roundabout take 3rd exit, 1 Lithgow Way is on the left hand side.